Wed., Aug. 22, 2018, 6:27 p.m.
MIAMI – The New York Yankees’ injury wave has reached the ninth inning. All-Star closer Aroldis Chapman was placed on the 10-day disabled list Wednesday with tendinitis in his left knee. He joined right fielder Aaron Judge, shortstop Didi Gregorius and catcher Gary Sanchez on the DL for the Yankees, who have baseball’s second-best record despite their misfortune. Manager Aaron Boone said he expected Chapman back for the final stretch for the season. 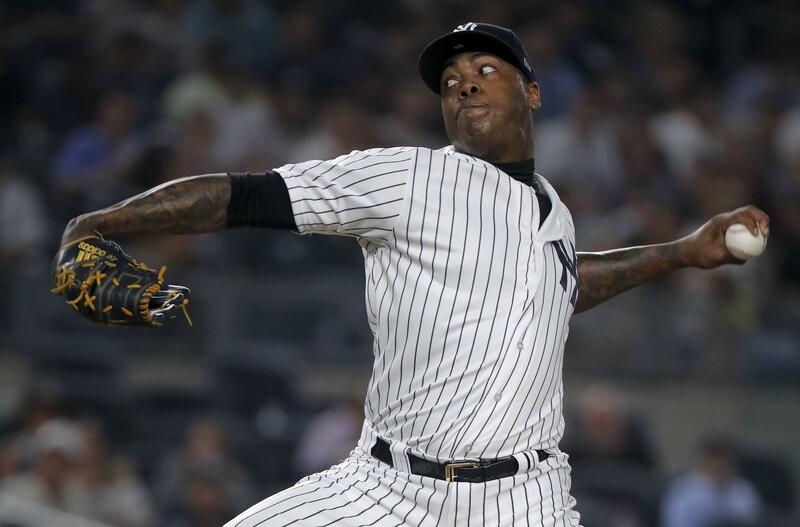 Chapman said he hoped he would be ready to pitch again as soon as he’s eligible. Chapman said his knee discomfort dates back to May, but this is his first stint on the DL this year. The diagnosis came after he underwent an MRI, and he’ll fly to New York for further examination Friday. Chapman entered Tuesday’s game at Miami in the 12th inning to try for his 32nd save. He walked Isaac Galloway leading off, threw one pitch to the next batter and then departed. In Chapman’s absence, closer duties will be shared by left-hander Zach Britton and right-handers Dellin Betances and David Robertson, Boone said. Published: Aug. 22, 2018, 6:27 p.m.